The SmartCut? Pro Series rotary trimmers offer excellent durability and dependability for everyday cutting projects. For flexibility in cutting styles, optional wave and perforated blades are available separately. Great for trimming paper, signs, presentations, photos, labels, laminated items and more. Steel blade cuts up to 10 sheets of 20 lb. paper. Sturdy metal base and non-slip rubber feet keep trimmer in place while cutting. Transparent paper guide eases placing paper under cutting rail. Replacement cutting mats are available separately. Alignment grid and dual scale (US and metric) ruler for precise measuring. Choice of 15" or 12" cutting length. Limited one-year warranty. It’s was great but I wasn’t the machine I was looking for but I did find the one I needed ! ! I was a little doubtful about a rotary paper cutter but I hated having the guillotine type around where there were children. The Smartcut get the job done accurately, safely and without any ragged edges. It cuts through card stock like a hot knife through butter. I would never go back to the other type and I would highly recommend this product for your home or office. My wife and I purchased this trimmer over a year ago for our business needs. We have cut over 10,000 pieces of 65 pound paper so far (three at a time) and will do many more in the future. The cuts are clean, the blades are easy to change and I just "rotated" the cutting mat for the first time. I thought I would have to replace the mat; however, the online manual said to turn it around 180° and continue using it. I did and the cuts are like the trimmer is new. Overall rating - a great product! 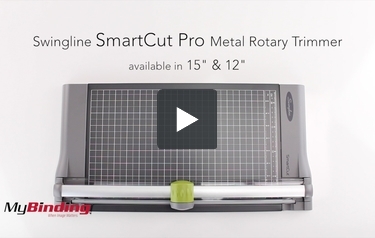 This is the Swingline SmartCut Pro Metal Rotary Trimmer! It has inch and centimeter measurements on the width side, and measures out the either 15 or 12 inches. I’m demoing here the 15” model. It also has a sturdy metal base. It claims to cut through 10 sheets at a time, and it does so easily and with a clean cut. With every cutting pad you can rotate it 4 ways, two on each side, if you notice your cuts are not very good. Or remove and replace it with a new one. To change the blade, open the cover by pulling on it. Unscrew the nut holding the blade on, then remove the blade and swap it with a different one. Screw the nut on to hold the new blade and pop the cover back on, this could take a little more effort and finesse. Swingline makes some terrific rotary trimmers including the SmartCut Pro 9515. If you're looking to get a device such as this, be sure to keep reading to discover its strengths and weaknesses. The 9515 has a 15-inch cutting length so you'll be able to trim both letter- and legal-sized documents quickly and easily. This cutting length is an improvement over the 9512, which can only cut items that are up to 12 inches long. This cutter has a blade that's made of steel and pretty durable. The blade can easily slice through laminating film and photographs, so you'll be able to use it for a variety of projects. However, you'll still be able to stay safe because the blade is located in a plastic cutting head. If you want to use different cutting styles, there are specialty blades you can buy for this device including wavy and perforating ones. These can come in handy if you want to give your documents a different look. The 9515 comes with an alignment grid so you'll be able to easily measure your paper before cutting it. The base also has metric and standard measurement units printed on it so you can use your preferred system. Everything is clearly marked and easy to read. The base of this trimmer is made out of metal and is really durable. It has rubber feet on the bottom of it so the unit will stay in place during use. There's a transparent paper guide on top of the base that also helps make the process as easy as possible. The 9515 is affordably priced so you'll be able to enjoy Swingline quality without going broke. This device is under a 1-year warranty. This trimmer has a fairly small cutting capacity. It can only cut about 10 sheets of paper at once, so it's not ideal for trimming a lot of paper on a frequent basis. It would be better suited for occasional use as well as small jobs. The 9515 comes with a cutting mat, but it will get beat up if you use the trimmer a lot. Luckily, there are replacement mats available for purchase. The Swingline SmartCut Pro 9515 has a lot more strengths than weaknesses. Its main weakness – its cutting capacity – makes it better suited for small jobs. In other words, as long as you don't need to work with a big stack of paper at once, it should be okay. This device has a good cutting length and it's great that it can be used to trim photographs and laminated items. The specialty blades will be good to use with those special documents and the alignment grid makes it easy to trim your paper accordingly. And, of course, the device has metal components for durability. As long as the cutting capacity isn't an issue for you, you'll find that the 9515 is a great trimmer to have around. Get yours today. Cutting Length 15" 12" 15" 18" 24" 12" 12" 12"
Thank you for you question. We carry replacement blades for Swingline SmartCut Pro line of trimmers. You can find them here .